Finding a new hobby or passion that lifts you up is always exciting. We want to learn as much as possible and excel at it as soon as possible. And with all the difficulty with picking up a brush pen for the very first time, you might be tempted to give up, because it’s too hard, and because it’s going to slow. And we’ve all been there! We’ve felt what you’ve felt and I’m pretty sure that not one lettering artist today would say they regret keeping at it. Practice makes progress, not perfect. One thing that will improve your brush lettering faster is to make slow deliberate moves with your pen. 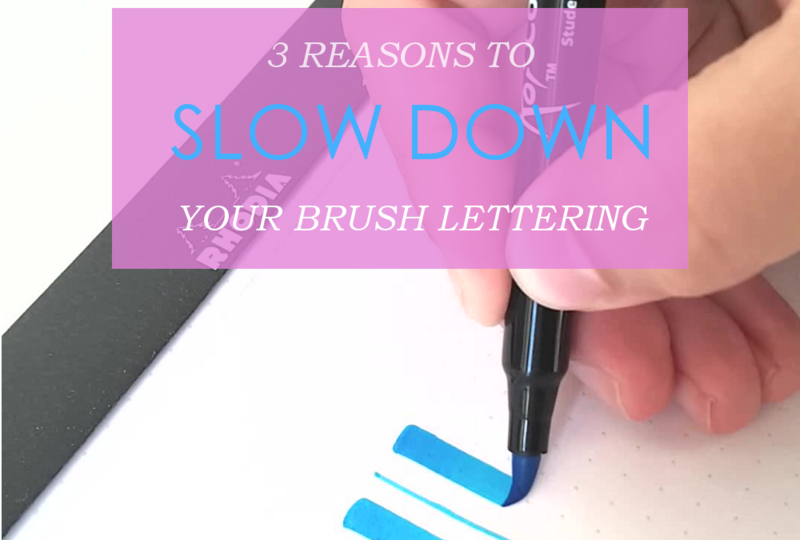 It might sound hard to try to make a brush pen go slow on the paper, as the flexible tip might feel like it wants to point in all directions, but it will help you reach your goals faster. This post lists the reason why. Making thin upstrokes with your pen is one of the most difficult things when you start out. (Remember that a big part of it is holding the brush pen at an angle) The strokes will look shaky and the slower you go the more you’ll feel the pen shake. This can give you the desire to speed up when making thin lines. Go slow anyways. Practicing slow movements with the pen will actually teach you to control the pen faster than if you speed up the strokes. In time you’ll feel your hand moving steady when creating the strokes. Going fast will occasionally result in a perfect stroke while at other times your stroke will be too long, or not the same width throughout your word, or not following a straight line. The most important thing when looking at calligraphy is the perception of consistency. You want all your thick downstrokes to have the same width and all your thin strokes to be equally thin. By slowing down, you’ll have more control over the consistency of your letters. Why do we practice? We want to be able to brush letter with ease. Picking up a pen and seeing magic come out. You can reach this state! We practice drills and strokes and letters to build our muscle memory. When your hand picks up a brush pen, it will remember the grip, the angle, the strokes and the letter connections. If you’re going to fast or not being deliberate with each stroke you make, it will take longer for your hand to build the muscle memory you need to improve faster. Do you feel going slow is difficult? What other things are you struggling with? Let me know in the comments below and feel free to share what you think of this post and if it helped you. Talk to you soon!